The Global Prefilled Syringes Market accounted to USD 4.0 billion in 2016 growing at a CAGR of 10.0% during the forecast period of 2017 to 2024. The upcoming market report contains data for historic years 2015, the base year of calculation is 2016 and the forecast period is 2017 to 2024. Prefilled injecting devices are speedilydeveloping in the medicine field;they are replacing conventional syringe-vial combinations because of certain associated advantages which includegrown patient safety and convenience presented to healthcare physicians in dose preparation. Increasingstyle of self-injecting devices adopted for the management of chronic diseases, such as diabetes and rheumatoid arthritis. By material the global prefilled syringes market is segmented glass prefilled syringes, polymer based prefilled syringes, and plastic prefilled syringes. On the basis of the design global prefilled syringes market is segmented intosingle-chamber prefilled syringes, customized prefilled syringes, and dual-chamber prefilled syringes. By type the global prefilled syringes market is segmented into conventional prefilled syringes, safety prefilled syringes. On the basis of application the global prefilled syringes market is segmented into monoclonal antibodies, rheumatoid arthritis, anaphylaxis, cancer, diabetes, multiple sclerosis, vaccines, and others. 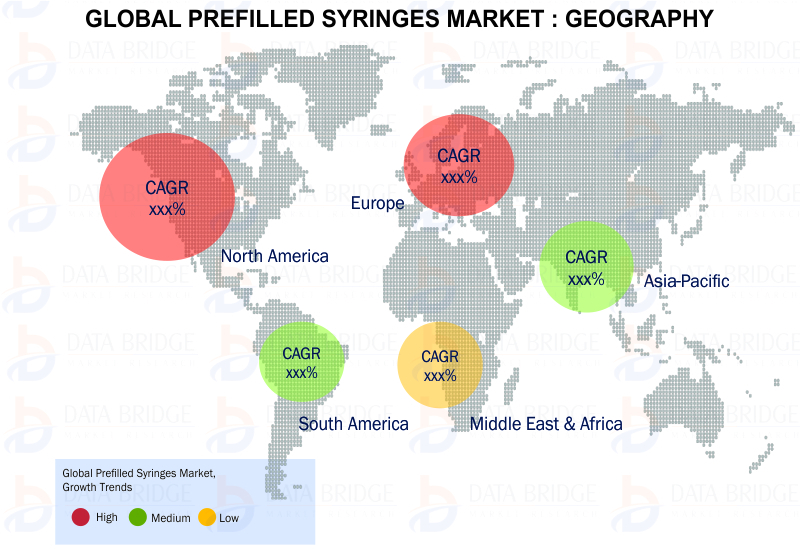 On the basis of geography, global prefilled syringes market report covers data points for 28 countries across multiple geographies such as North America & South America, Europe, Asia-Pacific, and Middle East & Africa. Some of the major countries covered in this report are U.S., Canada, Germany, France, U.K., Netherlands, Switzerland, Turkey, Russia, China, India, South Korea, Japan, Australia, Singapore, Saudi Arabia, South Africa, and Brazil among others. In 2017, North America is expected to dominate the market. The global-prefilled syringes market is highly fragmented and is based on new product launches and clinical results of products. Hence the major players have used various strategies such as new product launches, clinical trials, market initiatives, high expense on research and development, agreements, joint ventures, partnerships, acquisitions, and others to increase their footprints in this market. The report includes market shares of prefilled syringes market for global, Europe, North America, Asia Pacific and South America. Data collection and base year analysis is done using data collection modules with large sample sizes. The market data is analyzed and forecasted using market statistical and coherent models. Also market share analysis and key trend analysis are the major success factors in the market report. To know more please Request an Analyst Call or drop down your inquiry. Demand Side Primary Contributors: Doctors, Surgeons, Medical Consultants, Nurses, Hospital Buyers, Group Purchasing Organizations, Associations, Insurers, Medical Payers, Healthcare Authorities, Universities, Technological Writers, Scientists, Promoters, and Investors among others. Supply Side Primary Contributors: Product Managers, Marketing Managers, C-Level Executives, Distributors, Market Intelligence, and Regulatory Affairs Managers among others.